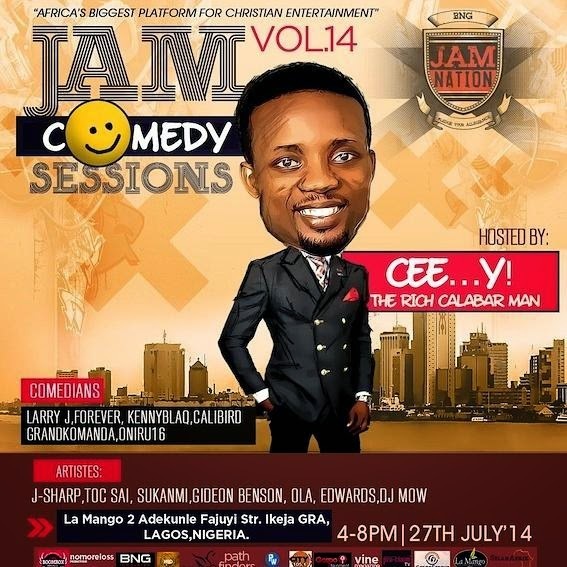 BNG’s JAM Sessions is all set to host an exciting edition of it’s monthly Christian entertainment event series with a “Comedy” special this Sunday, July 27, 2014. It’s been themed “JAM Comedy Sessions”. The event which is the 14th of the series will be hosted by ace comedian Cee-Y (The rich calabar man), and will feature various other comedians including Larry J, Forever, Kenny Blaq, Calibird, Grand Komanda and Oniru16. Artistes expected to perform include J-Sharp, Toc Sai, Sukanmi, Gideon Benson, Ola, Edwards; with music from DJ Mow.